National Award winner Aravind talks about his musical journey. 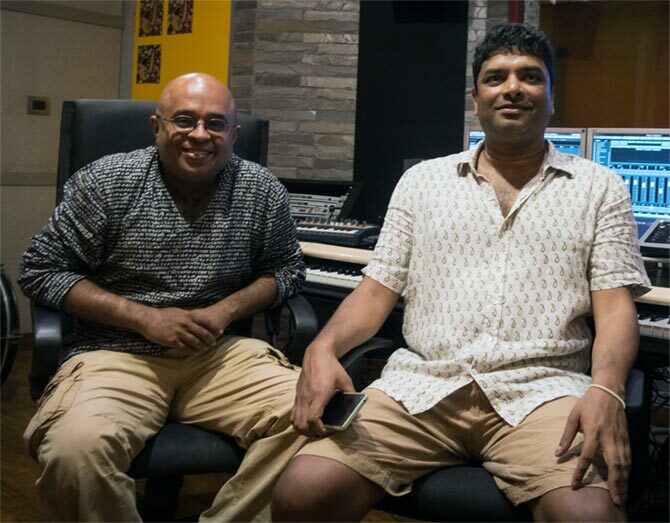 Chennai-based music composer duo Aravind and Jaishankar have been honored with the National Award for their exceptional background score in the documentary film, A Far Afternoon. The film also won its director Sruti Harihara Subramanian a National Award for Best Art/Cultural Film. 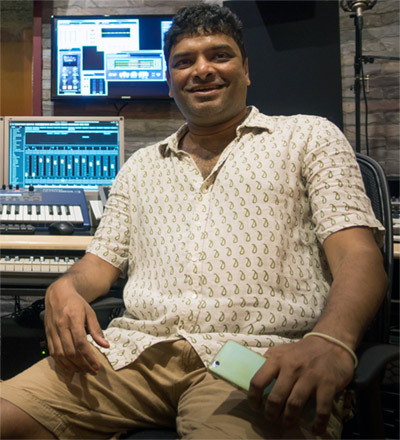 Aravind and Jaishankar have been a part of this industry for almost 20 years now, having composed for over 1,000 jingles, several short films, documentaries and feature films. In this interview with Rediff.com contributor S Saraswathi, a very pragmatic Aravind talks about what it takes to survive in this extremely competitive industry. It was a huge surprise for us and feels very good. Everyone is very happy with this recognition. We know Sruti, the director of the film, very well. We have worked together in various ads and corporate films. She approached us and gave us a brief about the project, and the artist and what he proposed to do. It was a different concept, the story of an artist through his painting. And that interested us -- it was not the commercial kind of a film. Since we have worked together earlier, things just fell in place. At what stage of production did you get involved? We were involved with the project right from the beginning. Initially, they had created a small trailer for the film, for which we composed the score. But that was different from what is there in the film presently. Did you work around a particular theme for the film? The plan was to keep it very minimalistic --not to put in too many instruments or too much music in the film. We wanted to maintain the natural sound and the silence. Since the subject of the film -- the artist Mr Khanna -- had a personal interest in Carnatic and Western music, we wanted to create something that combined the two. Can you give us more insight into the compositions? The compositions were in Shankarabharanam, and it was played on a Cello, which is a very unlikely instrument for Carnatic music. We did not want it to sound like something straight out of Carnatic because of the artist's keen interest in the different genres of music. He has been in the South, and enjoys Carnatic music, but with his North Indian background, he also understands the Hindustani classical, as well as Western music. We tried to bring in all those elements. The mood throughout the film was very meditative, so we had to maintain that aura. It was like creating a piece that is an extension or a reflection of the artist’s mind. How much importance do filmmakers give music? I think in India, music is given a lot of importance. In the West, if you take mainstream cinema or any kind of film for that matter, the amount of music in the movie will be very little. Every filmmaker wants to have music and songs in his movie. It does not matter what the format, even if it is a jingle, they want music and they are very specific about what they need. Is the same respect given to the musicians? It has improved a great deal over the last 20 years. These days, people recognise and admire not just music directors but even remember the names of individuals who played the guitar or the flute in a particular song or the background score. Today guitarists like Keba Jeremiah and Naveen Kumar, who has been playing the flute for top composers like AR Rahman and Ilayaraja, have become stars in their own right. This was nowhere possible 20 years back. There is far more exposure today. I believe it all started in the 1990s, when Rahman started mentioning the names of all his musicians in the cassette covers. Slowly that picked up and thanks to the internet and people writing blogs, musicians are getting the respect they deserve. Take, for example, any old song and ask someone, who played a particular instrument, nobody will know. Today it is a common knowledge. Though we have had no formal training in music, it has always been a part of our lives. Both Jaishankar and I come from families with a musical background. Both of us played in bands at college level. I played the bass guitar and Jaishankar played the keyboard, drums and the guitar. It was during that time that we were introduced to each other by mutual friends; we hung around together and somehow everything just clicked. We started our musical journey together in 1997. Over the years, we have worked in several documentaries, short films, commercial feature films, we also do a lot of ads, corporate films and video games. We have our own specialties. Jaishankar is into sound, technology and acoustics, that is his strong point. I do a lot of programming and composing. But there are no hard and fast rules or a fixed pattern. It depends on each project. Is this a very difficult industry to survive? I would definitely say so, especially now, because there is so much competition. It is relatively easy to enter but to push and survive over the long run is a challenge. I guess we have been lucky, it is almost 20 years now. You have some good times, and some bad times. But if you are strong enough and have the support system to withstand those times, it becomes worthwhile. The recognition and money at the top is good, but for those at the bottom, not so much. You have to reach beyond a particular level for the applause and acclaim. But getting to that point is never easy.